Part of the 1901 Census records for the Nottingham Training Institution for Pauper Children, showing James Schofield as one of the inmates. 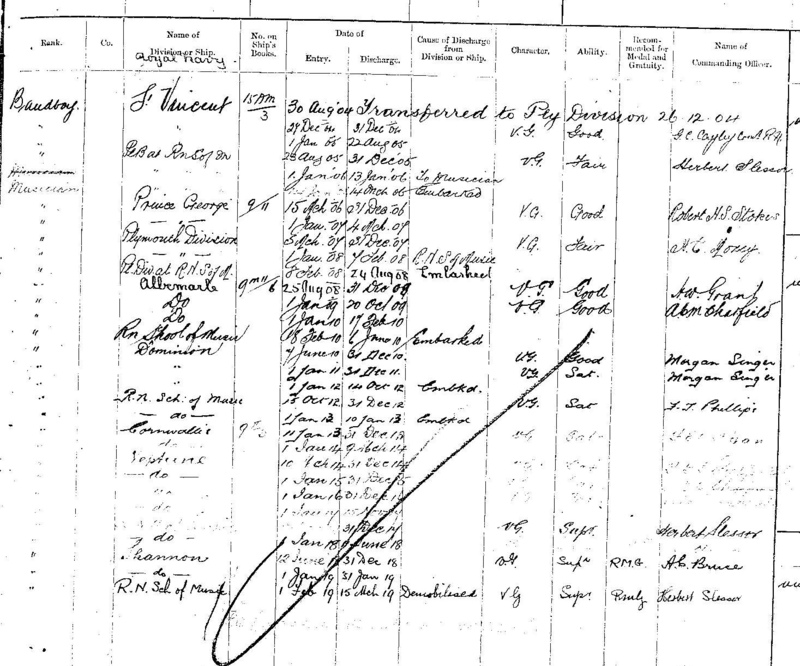 The 1881 Census page, showing the Schofield family boarding in Lenton, Nottingham. James Schofield, in the Register of Royal Naval Seamen 1899-1919, showing the three entries for his next-of-kin. Part of the list of men aboard HMS Neptune during WW1; the members of the Marines band. HMS St Vincent in 1897, the training ship James Schofield served on 1904-1906. 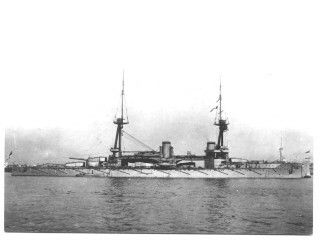 A picture of battleship, H.M.S. Dominian, launched 1903. Dreadnought H.M.S. Neptune: James Schofield served on this vessel during WW1. This armoured cruiser, H.M.S. Shannon, was James Schofield last vessel during his service career. James Schofield is one of the men listed in the Bottesford absentee voters list of 1918 as: James Schofield, High St Bottesford, 601 Musician, Royal Naval School of Music, Eastney, R.M. The censuses provides no information of any people called Schofield in Bottesford, so there was some uncertainty initially as to who James Schofield was and why he should be listed as an absentee voter in Bottesford. Indeed, Schofield is predominantly a north of England name, with a strong concentration in the Oldham-Bolton area, and very few occurrences further south. However, research online (Find My Past) has resolved many of he questions regarding him. James and his family did come from Nottingham and Redmile, Leicestershire. He should not be confused with Pte 1542 James Schofield, who came from Barkestone-le-Vale, and who died of malaria while serving with the South Notts Hussars in the Balkans in 1916. His military service records three next of kins, two of the names crossed out, the third being his wife Ada. One of the crossed out was his sister, whose name was given as G.H. Parr, of Redmile, near Bottesford. Examination of the census reveals the following: G.H. Parr was in fact her husband, George Henry Parr, born 1881 in Redmile. In the 1911 census he gave his occupation as a master baker, the address as 4 High St, Bottesford, and his wife, James Schofield’s sister (and next-of-kin), was Elizabeth Ann Parr. There were also daughters, Florence and Edna, a nephew Arthur Mawson and son-in-law John Francis Schofield, whose presence confirms that Elizabeth Ann’s maiden name was Schofield. In the 1881 census we find John Francis and Elizabeth Ann Schofield living with their parents, Isreal and Louisa Schofield (or Scoffield), both born in Redmile. At this time in 1881, the family was boarding with a 75 year old widow named Mary Flamstead at 8, Michael Place, Lenton, Nottingham. The General Register (BMD) provides confirmation that Israel Schofield was born in 1854 in the Grantham area, that he married Louisa Barnes in 1883. Unfortunately the record of his death was not located, but Louisa Schofield (nee Barnes) died in 1895 in Nottingham, aged 37. 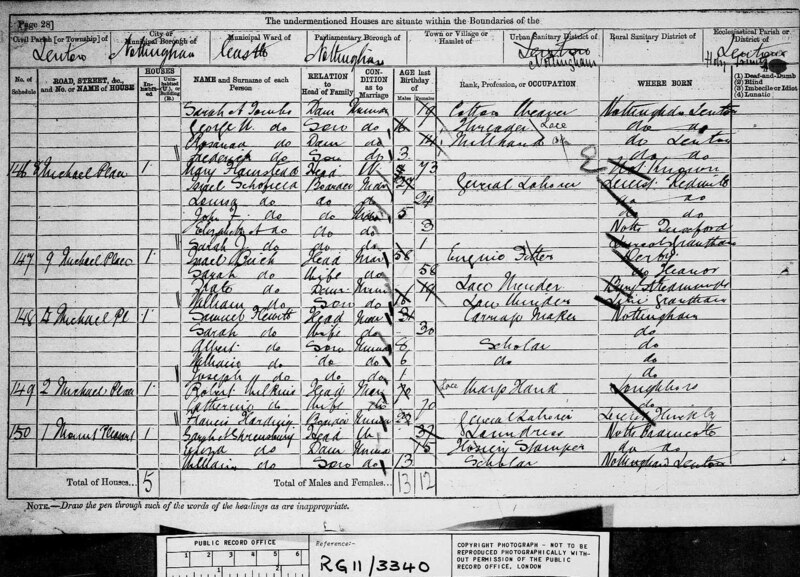 In the 1891 census we find Louisa Schofield, 34, a widow, working as a washerwoman, living at Page St, St Nicholas, Nottingham, with son John aged 16, a collier, Eliza aged 14 scholar, Willie aged 9 and Annie aged 6. There was also a family of boarders. Clearly Israel had died and the family were on hard times. 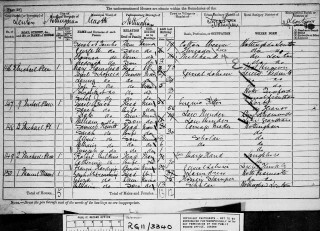 There is no mention of a son called James, born in 1888 – perhaps he had been given up to the poor house by this time and is not recorded in the census. When Louisa died in 1895 all the children were left as orphans. John would have been 20, Eliza (Elizabeth) 18. Probably, John became head of the family, but James remained in the poor house. Unfortunately, the family do not appear to be recorded in the 1901 census, although this is where James first appears, as an inmate of the Nottingham Training Institution for Pauper Children. This was the former Radford Workhouse, located on Hartley Road, Radford in Nottingham. The building was demolished in 1961 (see Workhouses website) and the site is now occupied by modern housing. In the 1901 Census, James Schofield was one of 118 boys, plus 95 girls, in the Institution on the night. The chronology appears to be that Israel Schofield (or Scoffield) was born in 1854, son of Josh and Ann Scoffield at Redmile. His first children, John Francis and Elizabeth Ann, were born 1876 and 1878 respectively, even though he did not get married until 1883 to Louisa Barnes. Either the children were illegitimate or he had an earlier wife who died between 1878 and 1883. Two more daughters followed, and finally in 1888 son James (as confirmed by the fact that James recorded Elizabeth as his sister in his military record). Sadly, Israel died while James was still an infant, and mother Louisa must have decided to place James in the Pauper institution rather than try to care for him herself. Then when James was seven his mother died, leaving him an orphan. James had left the Pauper Children Institution, where he is recorded in the 1901 census,by 1904. He is seen in a picture of Barkestone-le-Vale village school, said to have been taken in 1904. This appears to indicate that he was 15 or 16 years old at the time, and must have been taken before he joined the Royal Navy, later in 1904.The boy in the picture hardly looks 16 years old, but there is a determination in his features. Did he claim to be older than he really was when he enlisted? After joining the navy, he spent 15 years in service, becoming a long-standing bandsman (a trombone player) in the Royal Marines Light Infantry. He married in 1917, and was demobilised in 1919. We know nothing of his life thereafter, except that there is the record of the death of someone called James Schofield in 1971 in the Newark area. If this is the same man then he would have been 83 years old, his military service a distant memory. Miss M.Mears, 87 Belmont Street, Elm Grove, Southsea. 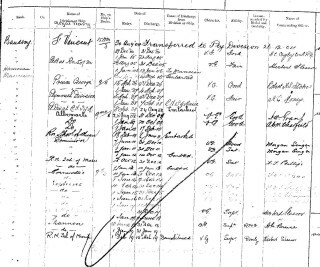 The 1911 census records a Martha Mears, then aged 12 and born in Portsmouth, at 85 Belmont St where she was a visitor to Alfred Thomas Grout, 65, pensioned joiner dockyard and his wife Emily, 67. James’ wife Ada, a nurse at the War Hospital, Green Road, Paisley (see canmore.org.uk ). They married on August 30th 1917. The information that we obtained via Find My Past is a series of pages from the Register of Royal Navy Seamen. Each refers to James Schofield at successive stages in his service with the Royal Marines. Information has also been found via Ancestry and Wikipedia. After joining on August 30th 1904 at Gosport, he served one year and 137 days as an under-age recruit. During this time he spent almost a year on H.M.S. St Vincent. 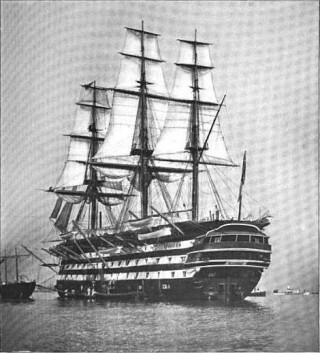 This illustrious ship had been launched in 1815 and had served the flagship of Sir Charles Napier commanding the Channel Fleet 1847-1849. She later served as a training ship from 1862 until 1906 when she was broken up. 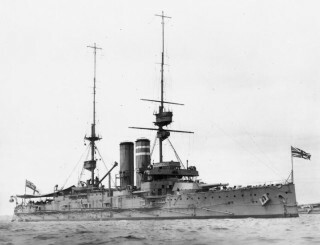 He was then successively aboard Royal Navy battleships: H.M.S. Prince George (15/3/1906-4/3/1907), H.M.S. Albemarle (25/8/1908-17/2/1910), H.M.S. Dominion (7/6/1910-14/10/1912), H.M.S. Cornwallis (11/1/1913-9/2/1914), and H.M.S. 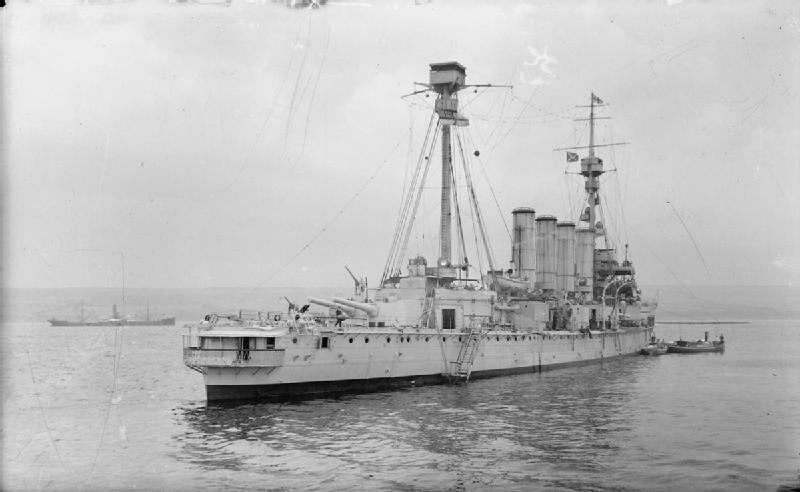 Neptune (10/2/1914-11/6/1918); ending his naval career on the cruiser H.M.S. Shannon (12/6/1918-31/1/1919). He left the service on 15th March, 1919. Apart from the time at the end of WW1 and its conclusion that he was aboard the Shannon, he spent the whole of WW1 on H.M.S. Neptune, one of the Dreadnought battleships, the pride of the Royal Navy. The list of Royal Marines on board Neptune includes the band, comprising the band master and twelve bandsmen, including James Schofield. H.M.S. 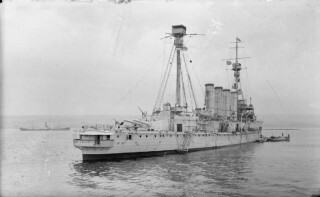 Neptune was the flagship of the Home Fleet from May, 1911, until May, 1912, when she was transferred to the 1st Battle Squadron, where she remained until June, 1916, just after the Battle of Jutland. She was accidentally struck by SS Needvaal in April 1916 but no serious damage was done. She was present at the Battle of Jutland as part of Admiral Jellicoe’s Battle Fleet. She fired only 48 12 inch (305 mm) shells but is credited with scoring several hits on the German battlecruiser Lutzow. When he was demobilised, James Schofield had completed almost fifteen years of continuous service. He was awarded the 1914-15 Star, Victory & British War Medals. He was a married man. From spending his childhood within the confines of the Pauper Institution in industrial Nottingham, he had enjoyed (presumably) a long career on the high seas, and had become an accomplished musician. It would be good to learn something of his life after WW1. A man called Schofield is mentioned in an article published in the Grantham Journal on the 26th July, 1919, describing the peace celebrations in Bottesford the previous saturday (July 19th). Part of the proceedings was a parade starting at one o’clock, in which “the Bottesford sailors and soldiers paraded, the Bottesford Brass Band, under Bandmaster Schofield, being also present”. It is tempting to assert that this was the James Schofield who had been a bandsman with the Royal Marines, but there must remain a straw of doubt until corroboration can be found. Attempts to locate him in electoral rolls and the 1939 register have not been successful. We know that a man by his name died in the Newark area in 1971, and again it is tempting to assert that this is the ex-marine, but there is no certainty as yet. Find My Past is acknowledged for most of the information presented here. The year and place of James Schofield's death have not been confirmed pending family information or a copy of the Death Certificate. Pictures are from Wikipedia. Additional information was found using Ancestry and other websites as indicated in the text.